If you were disappointed by the movies in 2011, and especially if you think that most of the nominees for Best Picture are lackluster and undeserving, I recommend you make every effort to seek out the Oscar nominated shorts. They are ALL good and some are exceptional. Be forewarned, however. "There is no dearth of troubling subject matter,... especially in the documentary category," begins Stephen Holden in his New York Times review, and concludes, "If some... are stronger than others, there are no lemons among them, and a half-dozen are truly memorable." There is also a great deal of musical talent on display in the soundtracks. 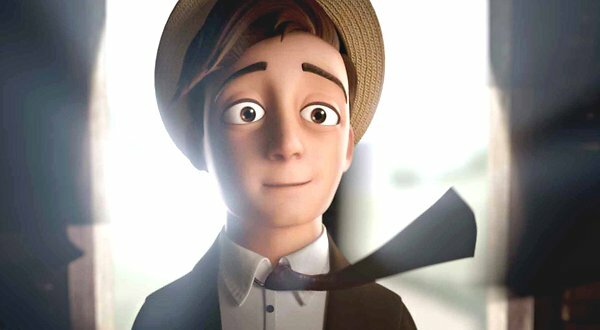 Patrick Doyon’s Dimanche/Sunday (Canada) has been "Described as a love letter to children’s imagination...." A little boy goes through the Sunday family routine ignored by the adults and left to his own imagination, which takes its magic realism bent at face value. The drawings are wonderful, as is Luigi Allemano's original soundtrack. The director Grant Orchard says A Morning Stroll (UK) is "based loosely on a real life event recounted in Paul Auster's brilliant book True Tales of American Life." 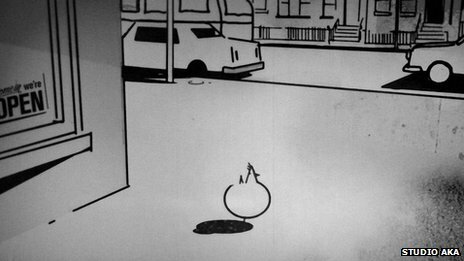 A chicken takes the same walk through the streets of New York City each day from 1959 into a dystopian future, and despite mounting catastrophes, remains unruffled. 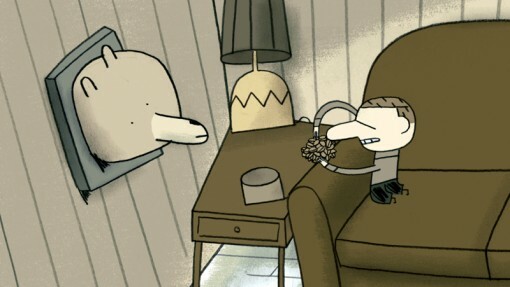 This is a clever entertainment, but it was by far my least favorite of the animated shorts. Curiously, I found a different claim for the source. J. R. Jones writing on Reader says, "The source material is 'The Chicken,' a short story by one Casper G. Clausen that appeared in the New York Literary Review in 1986...."
Enrico Casarosa of Pixar directed La Luna (USA), a sweet little coming of age story about a boy who goes out in a rowboat to work with his father and grandfather for the first time. Once out at sea the father pulls a ladder out of the boat and motions to the boy to climb it. The boy arrives at the moon, which is covered, to his delight and ours, in gold stars. Father and grandfather join him and proceed to teach the boy how to sweep the moon and take pride in him as his confidence grows. William Joyce and Brandon Oldenburg's The Fantastic Flying Books of Mr. Morris Lessmore (USA) is a captivating allegory about the worlds of imagination that literally LIVE in books. A man who is something of a cross between Buster Keaton and Jacques Tati is whisked away by a storm -- along with his library -- to a land where books have come alive and fly off their shelves like flocks of birds. There have been many homages this year; this one is a magical bow to books. Variations on "Pop Goes the Weasel" provide the delightful soundtrack. Set in 1909, Amanda Forbis and Wendy Tilby's Wild Life (Canada) is about a young Englishman who sets out for Alberta, where he buys ranchland, ready to make his mark. He finds himself utterly unprepared for the demands of the wilderness, but tries his best to put a veneer of success and confidence into his letters home. Increasingly, his solitude and longing become too heavy. Judith Gruber-Stitzer composed the wonderful original music. In Peter McDonald’s Pentecost (Ireland), a mischievous Irish alter boy, who loves soccer above all else, has been banned from his duties because of an accident he has caused during mass. As a result his father deprives him of anything soccer. But when the Bishop announces a visit, the boy must be called back due to a shortage of altar boys. The film charmingly puts an overlay of football locker room pregame coaching over the preparations for the Bishop's Sunday Mass. The “Ode to Joy” portion of Beethoven’s Ninth Symphony serves as the soundtrack in an electro house music incarnation with synthesized four-on-the-floor beat bass line that crescendos and decrescendos with the action. Max Zähle’s Raju (Germany/India) is a beautiful story about the sad reality of the child trade in India. A German couple have traveled there to adopt an orphaned boy. He and his new father stand on a crowded urban street watching kites overhead when the child vanishes in a mere instant. The father panics and calls out. His desperate search leads him to disturbing information that will force the adoptive parents to an agonizingly painful decision. The Schuster Institute for Investigative Journalism of Brandeis University has information on fraud and corruption in international adoptions. In The Shore (Ireland), directed by Terry George, an American returns to his native Belfast after many years, bringing his adult daughter with him. Trying to learn more of her father's past, she encourages him to visit the fiancé he ignored once he got to the States and his best friend who married her. He is reluctant, but the reunion becomes a parable of forgiveness, love and the healing possibilities of time's passing. Andrew Bowler's Time Freak (USA) was my least favorite short live action film. Stillman is an OCD nerd who inhabits a warehouse space with his charts and formulae -- and a clunky time machine he has invented. It's Groundhog Day all over again, but a Groundhog Day Stillman gets to fine tune. He has always dreamt of time traveling back to ancient Rome, but his neurosis limits his travels to mere minutes or hours back in time trying to get some bit of minutia right (perhaps reflected in his name, Still-man). His friend Evan has serious concerns about the hold the obsession has on Stillman, but cannot help himself being drawn in deeper. Hallvar Witzø's absurdist Tuba Atlantic (Norway) finds Oskar driving his Christmas-light-strung tractor, then racked by a coughing fit. When his doctor gives the 70-year-old six days to live he calls his estranged brother in America. No answer. So Oskar he sets out to resurrect a monumental tuba the brothers patched together out of scrap metal as children to signal his brother across the Atlantic. Cantankerous by nature, Oskar is more than a little annoyed when Inger shows up to announce she is working to become an official Angel of Death for the local Jesus Club. Suffering not only his verbal aspersions but also his penchant for mowing down sea gulls with an ancient machine gun, she soldiers on for six days ticking off Oskar's six stages of grief in her Angel of Death handbook. Tuba Atlantic is a story of the redemptive power to be found in the unlikely intersection of disparate lives. "Not included in the documentary program," according to Stephen Holden in the New York Times "because of licensing issues is the fifth nominated documentary short, God Is Bigger Than Elvis, by Rebecca Cammisa. The film focuses on Dolores Hart, who in her early 20s abandoned a Hollywood career to become a Benedictine nun." Maureen Dowd wrote a piece about the film in her weekly editorial column in the NYT. James Spione’s Incident in New Baghdad (USA) is narrated by United States Army specialist Ethan McCord. In 2007, McCord was present when an American helicopter attack killed two journalists and nine Iraqi civilians. McCord was able to pull two young children from the wreckage. The memories of the incident haunt McCord, who was denied treatment for post-traumatic stress disorder. Upon his return to the United States he has gradually come to terms with his demons and brings his experience to bear on his love for his own children. This article by David Montgomery for the Washington Post details the events in New Baghdad. McCord now lectures on the rights of veterans traumatized by war. The HBO documentary Saving Face (USA/Pakistan), directed by Daniel Junge and Sharmeen Obaid-Chinoy, is heartbreaking and incomprehensible. The epidemic of acid attacks against Pakistani women is so widespread that the Pakistani government has had to open new burn clinics across the country. The BBC reports that "campaigners estimate that there may be as many as 150 victims every year." The film documents the efforts of Dr. Mohammad Jawad, a British plastic surgeon, who periodically returns to his native Pakistan in an attempt to give these women a degree of dignity. The film chronicles the struggles of Zakia and Rukhsana as they seek justice and the chance to be whole again. The Pakistani government recently passed the Acid Crime Prevention Bill 2011, but many women believe it does not go far enough. Another story of an acid attack victim is detailed in this report by Rania Abouzeid for Time World. Naila Farhat was attacked at age 13, and "For the next six years, Farhat doggedly pursued her case in the courts, attending every session despite the trauma of being in the same room as her tormentor; the schoolteacher was not charged, after he allegedly bribed local police and fled — a familiar occurrence, according to women's-rights activists who say some police are unwilling or unable to nab offenders. But Irshad Hussein was sentenced to 12 years imprisonment and ordered to pay damages of 1.2 million rupees (almost $15,000). He appealed and convinced a High Court to reduce his sentence to four years and 1.1 million rupees, with the proviso that if he agreed to pay the fine, his jail term would be voided and he would be released. "Undeterred, Farhat — with the support of the Acid Survivors Foundation (ASF) — went to the Supreme Court last November, where the original sentence was quickly reinstated, making her the first woman to win an acid-attack case in Pakistan's Supreme Court." ...accompanies another account, "Pakistan's Acid Attack Victims Pin New Hope on New Laws," which appears in Britain's The Telegraph. I include it because the publicity stills for Saving Face below are too tame to convey the film's content. Directed by Gail Dolgin and Robin Fryday, The Barber of Birmingham (USA) is a tribute to James Armstrong, a barber and raconteur in Birmingham, Alabama. Armstrong was one of the Southern foot soldiers of the civil rights movement who risked brutal physical attacks and jail to peacefully protest on the front lines of the struggle. Armstrong's shop is papered in news clippings, posters, photographs and other memorabilia, and he has never missed an annual reunion of the foot soldiers. He wanted to share history in the making at President Obama's inauguration, but was held back when he became ill. Nevertheless, he soldiers on and keeps the memory of Dr. King and the foot soldiers alive.